Now nearly all jewelry suppliers in Yiwu market can supply nickel-free jewelry. Anyway, the cost for nickel free and non-nickel-free are almost the same. As long as you state clearly on the invoice that you want nickel-free, nine out of ten times, you will get nickel free products. You forgot to write nickel-free on the contract, but only tell the showroom people(sales people)you want nickel free. There is a possibility that sales people can forget to pass your information to their factory. Factory run out of nickel-free components, and there is not enough time, or enough quantity to make nickel-free components. If your country(your customers) is very strict, i DO suggest you have a simple test during collection. 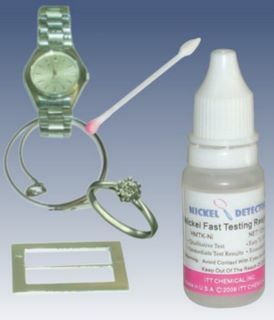 Nickel free test is very easy. You don't need to have a lab. at all. Just buy a nickel-free-test-kit, which only costs less than 20USD. This kit is a bottle of liquid(sorry for missing the exact word here)with dozens of cotton swab. 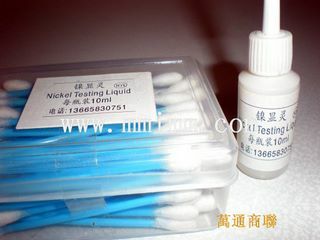 you just need to put some liquid onto the swab, then rub the swab with what you want to test, if the swab turns red, that means there are nickel, if the swab color keeps unchanged, there is no nickel. >> Return to buy from Yiwu from buy nickel-free jewelry from Yiwu China.